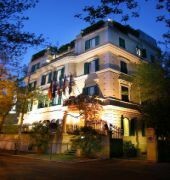 Once an aristocratic residence, today it is the seat of this luxury hotel. The building, dating back to 1906, was completely renovated in 2000 and opens onto a quiet street named after it. It is air-conditioned and comprises a total of 23 guest rooms on 4 floors. The handsome atrium lobby features authentic Italian object d'art from the XVII century as well as a 24-hour reception, a safe, lifts and currency exchange facilities. Within this distinctive atmosphere, guests will experience the warm hospitality and the efficiency of the friendly personnel, ready to give any tourist information or to cater to guests' every need. The elegant hall near the atrium lobby features period furniture and authentic works of art such as the Art Nouveau bureau (dating back to 1910) and the portrait of Pope Paul III. Further facilities include a bar, Internet access, room service, laundry service (for a fee) and parking facilities. Furthermore, in all our rooms and in all areas of the hotel there is free wireless Internet access. 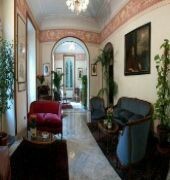 The FARNESE is a Tourist hotel. Located in Vaticano area. Shopping is within walking distance and the nightlife/restaurants are located in the hotel. Descriptionclass="small" style="text-align: justify; font-size:11px;">Once an aristocratic residence, today it is the seat of this luxury hotel. The building, dating back to 1906, was completely renovated in 2000 and opens onto a quiet street named after it. 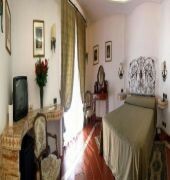 It is air-conditioned and comprises a total of 23 guest rooms on 4 floors. The handsome atrium lobby features authentic Italian object d'art from the XVII century as well as a 24-hour reception, a safe, lifts and currency exchange facilities. Within this distinctive atmosphere, guests will experience the warm hospitality and the efficiency of the friendly personnel, ready to give any tourist information or to cater to guests' every need. The elegant hall near the atrium lobby features period furniture and authentic works of art such as the Art Nouveau bureau (dating back to 1910) and the portrait of Pope Paul III. Further facilities include a bar, Internet access, room service, laundry service (for a fee) and parking facilities. Furthermore, in all our rooms and in all areas of the hotel there is free wireless Internet access.